Employers’ Liability Insurance, commonly referred to as EL Insurance, is one of the few forms of insurance that are statutory. All employers are required to hold Employers’ Liability Insurance in accordance with the Employers’ Liability (Compulsory Insurance) Act. Employers’ Liability Insurance indemnifies the Employer in respect of claims for injury or illness brought against it by a current or former Employee. The minimum limit of indemnity required by law is £5,000,000. In practice most policies have a limit of £10,000,000. Higher limits are available. Family businesses. If all of your employees are closely related to you (as your husband, wife, civil partner, parents, grandparents, step-parents, children grandchildren, stepchildren, or siblings) you will not need to purchase Employers’ Liability Insurance. It is very important to note that this exemption does not apply to Limited Companies. Companies employing only their owner where that employee also owns at least 50% of the issued share capital in the company. It is important to remember that the definition of an Employee is not just someone on your PAYE. 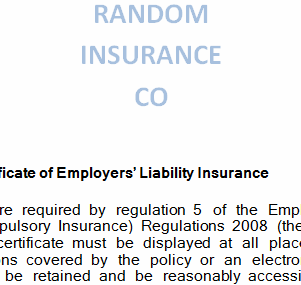 The law requires you to hold EL Insurance for people who you employ under a contract of service or apprenticeship. Labour only subcontractors working under your supervision, self-employed sales agents working exclusively for your company, apprentices, work experience students and volunteers are Employees in the eyes of the law. If you are not sure whether your business is required to hold Employers Liability Insurance please do not hesitate to contact us for advice.